Some of Ukraine’s leading reformers find themselves under attack in the week since U.S. Vice President Joe Biden urged Ukraine’s elected leaders to move faster to enact anti-corruption legislation. Addressing the Ukrainian Rada last week, Biden said the country’s leadership faces a "test of courage," and must honor the sacrifice of Ukraine’s revolutionaries by enacting tough reforms. But following his remarks and meetings with Ukrainian officials, there has been new pushback against the mostly foreign reformers in the Ukrainian government. Pro-Russian media outlets in Ukraine, for example, circulated a fake news story this week that Eka Zguladze, the deputy interior minister who spearheads Ukraine’s police reforms, was detained at Kyiv’s Borispol airport attempting to take millions of dollars of cash out of the country. The Interior Ministry officially denied these allegations, but the story lives on in social media circles echoing the Kremlin narrative. Zguladze was formerly Deputy Interior Minister of Georgia, where, in 2006, she led Georgia’s police reform under then-President Mikheil Saakashvili. Zguladze’s efforts to launch Ukraine’s new patrol police force have been widely reviewed as one of the most successful post-Maidan reforms. The false report comes just weeks after Zguladze was feted as one of Foreign Policy’s 100 Global Thinkers of 2016 for "instilling the Maidan’s spirit in Ukraine’s police force." Biden also singled out the U.S.-supported police reform as "[giving the people] hope of further reform, further progress." "Right now the national police is a big boat floating in a storm," says Khatia Dekanoidze—an ally of Zguladze, former director of Georgia’s Police Academy, and chief of Ukraine’s new National Police—speaking at the Atlantic Council on Dec. 16. "And we can't let this boat sink." Dekanoidze says one of the most important demographic factors of the new police force is that 90 percent of new recruits were a part of the protests on the Maidan and represent a new generation of Ukraine. "[The president, government, and parliament] see the reform of the National Police … All see it," Dekanoidze says. Zguladze previously said the hope is that "[the police] set a standard that influences the rest of the system." But former Georgian officials themselves are often the first to admit that, despite the early success of some initiatives, the problems facing Ukraine should not be underestimated. "The scale of Ukraine is so huge," Dekanoidze says. "Deeper. It is a very challenging situation. … A choice between evil and good. Between cleaning up Ukraine and fighting corruption, or not." Their previous boss, former Georgian President Saakashvili, is now governor of Ukraine’s Odessa region, where he pursues an aggressive reform agenda that he often says is opposed by officials in Kyiv, including Prime Minister Arseniy Yatsenyuk. Saakashvili described in a Dec. 6 speech in Odessa how billions of dollars have been lost to corruption in Ukraine, again directly naming Yatsenyuk as a beneficiary. He has offered to provide documentation of his claims to the cabinet of ministers. Yatsenyuk denies these claims. 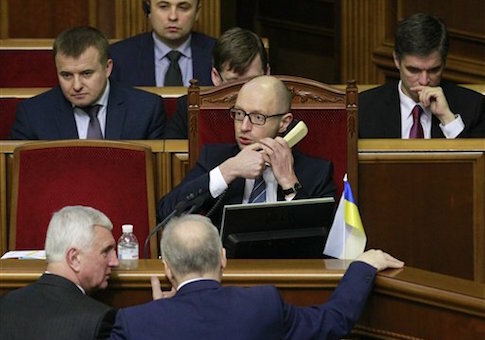 Yatsenyuk was delivering his annual address to the Rada on Dec. 11 when an MP from Ukranian President Petro Poroshenko’s bloc attempted to drag him from the podium and a brawl erupted. Yatsenyuk tried to calm the situation, saying the parliament included many "morons." Yatsenyuk has in turn accused Saakashvili of corruption. Saakashvili has denied all charges and has asked the Anti-Corruption Bureau to investigate the case. On Dec. 14, Saakashvili and Ukrainian Interior Minister Arsen Avakov got into a shouting match about corruption and reform during a cabinet meeting. Avakov hurled a water glass at Saakashvili. The meeting was summarily adjourned as they continued to trade insults. The video of the dispute received 6 million views in the first 24 hours after it was posted online. A recent opinion survey conducted by IRI showed that fighting corruption is by far the top concern of Ukrainian citizens. Saakashvili’s unedited style has earned criticism from some of his Ukrainian colleagues—and a call from Avakov for him and other Georgians to "get the hell out of my country." But the IRI survey named Saakashvili as the most favorable politician in the country, enjoying a wide margin of support over any politician in Kyiv. Hours after the clash with Avakov, a survey conducted by Ukrainian TV station NewsOne showed a staggering 97 percent public support for Saakashvili, versus 3 percent for Avakov. Avakov has filed a lawsuit against Saakashvili for "insulting his honor and dignity." He said Yatsenyuk should do the same. The Russian Foreign Ministry has commented on the spat, and Russian President Vladimir Putin used his annual press conference on Thursday to express his displeasure at Saakashvili’s presence in Ukraine. "Now the export of politicians [from Georgia] has begun," Putin said. "They are actively operating in … independent Ukraine … I think this is simply a slap in the face of the Ukrainian people. Not only have they been put under an external administration but they’ve also had to accept so-called politicians that were delegated there." But so far, the Ukrainian people don’t seem to agree. "Ukraine is clearly asking for leadership to be imported from the outside," offers Ilya Ponomarev, a Russian Duma Deputy living in exile following his solo vote against the annexation of Crimea. He is familiar with the political landscape in Kyiv. "Ukrainians want foreign guidance." Saakashvili and the U.S.-born Finance Minister Natalie Jaresko are often mentioned as possible successors to Prime Minister Yatsenyuk. Poroshenko’s office made a statement this week that "the issue of resignation of the Prime Minister is not on the agenda." Sources with knowledge of the American consultations in Kyiv have said the United States continues to back Yatsenyuk. The international financial institutions, including the IMF and the World Bank, insist that Yatsenyuk and Jaresko should continue to lead the talks. Local critics say this differentiation between public perceptions of performance and international support has contributed to political deadlock on the ground. Another former Georgian official, David Sakvarelidze, is now Deputy Prosecutor General of Ukraine, responsible for reforming the Prosecutor’s Office. He has also been the subject of attacks. "You probably do not understand who we are and for what purpose we come here," he said in an emotional Facebook post this week, referring to the numerous Georgians in posts in Ukraine. "We try to do what we think is right, offer all our experience, soul and energy. Our team has been together for 11 years. We have had victories and defeats, but something has always united us: the common values and moral satisfaction from the result." He continued: "to my great regret, [many politicians] naively believe that they were the leaders of the Maidan—not the people who were there and whom have entrusted them with this role." Ponomarev, the Russian deputy, shares concerns that if government does not move fast enough, the activists of the Maidan could return to the streets. "There could be more riots. But the worst case scenario isn't a fast track to another round of riots, which would be heavily influenced by Russia. It would be a decade like Russia in the 1990s—and what comes next is worse." "Ukraine needs a vertical approach to change," he offers. "It was a revolution, but the architecture of the new government is the same as the old. Some reforms have been successful—but these are only the reform of bits and pieces of a Soviet legacy." Others agree that deep institutional reform is an urgent priority. "Institutions can't hang on one person," said Dekanoidze. "We need government institutions. If I leave—if I survive—there must be a strong, tough institution … with good people inside and good functions." The week of political circus following Vice President Biden’s calls for unified action, with fisticuffs making headlines more often than substantive reform, has likely done little to inspire confidence.